Vijay Mallya has been on bail since his arrest in the UK in April last year and is fighting extradition to India on charges of fraud and money laundering amounting to Rs 9,000 crore. Told him no point talking to me, he must make offers to bankers: Jaitley; Mallya later says meeting not formal. Triggering a political firestorm in India, fugitive businessman Vijay Mallya said in London Wednesday that he had “met the Finance Minister” before leaving India in 2016 and “repeated my offer to settle with the banks”. Mallya’s claim was immediately dismissed as “factually false” by Union Finance Minister Arun Jaitley. Mallya, however, sought to downplay his comments later, saying it was “not fair” to create a controversy over a “totally innocent statement” and that he had only “happened to meet” the Finance Minister. The Westminster Magistrates’ Court in London is hearing Mallya’s extradition case, with the judge fixing December 10 as the date for the verdict. Jaitley wrote that since he was aware of Mallya’s past “bluff offers”, he did not allow him to proceed with the conversation and curtly told him “there was no point talking to me and he must make offers to his bankers.” Jaitley said he “did not even receive the papers that he was holding in his hand”. “Besides this one sentence exchange where he misused his privilege as a Rajya Sabha Member, in order to further his commercial interest as a bank debtor, there is no question of my having ever given him an appointment to meet me,” Jaitley said. Within hours of Jaitley’s response, Mallya confirmed that he had met Jaitley in Parliament and that it was not a “formal meeting”. “I happened to meet Mr Jaitley in Parliament and told him that I was leaving for London and that I want to settle with the banks and would he please facilitate a discussion. I did not have any formal meeting scheduled with him. I met him often enough in the Parliament, in the house and in the Central Hall and I have expressed to him my willingness to settle on many occasions. I don’t understand what this controversy is about,” Mallya said. The Opposition, however, hit out at the Government with the Congress and CPM raising questions over Mallya’s departure from the country. “Given Vijay Mallya’s extremely serious allegations in London today, the PM should immediately order an independent probe into the matter. Arun Jaitley should step down as Finance Minister while this probe is underway,” Congress president Rahul Gandhi posted on Twitter. CPM general secretary Sitaram Yechury said Mallya’s statement has put the Government in the dock. “It is not the Finance Minister alone, we cannot be sure what other facts are being hidden even now. The fundamental point is how he got away despite ‘lookout notices’? he said. Earlier, the 62-year-old Mallya described his situation as that of a “political football”. “There is nothing that I can do about it. My conscience is clear and I put almost Rs 15,000 crore worth of assets on the table of the Karnataka High Court,” he told reporters. 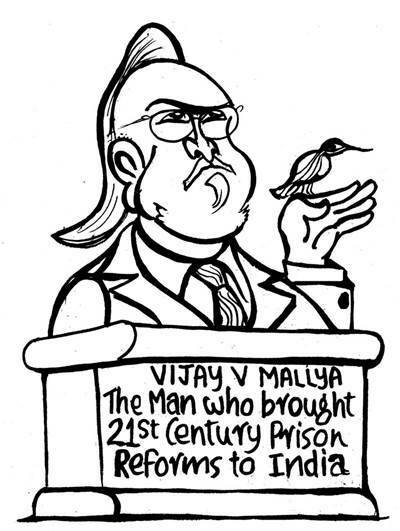 Mallya has been on bail since his arrest in the UK in April last year and is fighting extradition to India on charges of fraud and money laundering amounting to Rs 9,000 crore. The extradition trial opened at the London court on December 4 last year. On Wednesday, Mallya’s defence team, led by Clare Montgomery, branded the evidence presented by India as “utterly unfounded”. The Crown Prosecution Service (CPS), arguing on behalf of the Indian government, countered by saying that Mallya had intended “from the outset” never to repay the loans he sought for Kingfisher Airlines and misrepresented its profitability. “The government of India case that there was some secret pocket of knowledge about losses within Kingfisher Airlines, which were not revealed to the banks, is utterly unfounded. That this was a carefully thought out dishonest strategy, knowing KFA was bound to fail, is just nonsense. It was a financial disaster, not as result of dishonesty but the result of a failing airline failing to recover,” Montgomery said. She dismissed the CPS argument that there was “stark disjoint between what Mallya knew and what the banks knew” and also accused the Indian authorities of leaving documents “out of the bundle” that prove that “KFA was the victim of the economic climate” and not any deliberate fault. The defence team also rubbished a video of Barrack 12 at Mumbai’s Arthur Road Jail, which was submitted by the CBI on the directions of Judge Emma Arbuthnot for “the avoidance of doubt” over the availability of natural light in the cell where the businessman is expected to be detained pre-trial, during trial and in the event he is convicted by Indian courts. “The video clearly shows the gloom that settles on this building, which is encased in what is effectively a steel oven… It is impossible to be satisfied about humane lighting and ventilation,” Montgomery said, claiming that it had been tidied up for the video and did not match with photographs previously provided by India. As part of its closing submissions, Mallya’s defence team repeated its claim that the case was “politically motivated”. It alleged that the CBI had been “forced to file charges” and referred to a newspaper report against CBI special director Rakesh Asthana, which claimed that he threatened the heads of state-run banks with reprisals if action was not taken against Mallya. “Mr Asthana has been solemnly sitting in court. If this were fake news, it could have been dealt with,” Montgomery said.